We all know that cats are amazing jumpers, but sometimes they jump in places that we aren't so happy about like our dining room table. Contrary to popular belief cats are very trainable and you can train your cats as to which places in the house are off-limits. Try some of the tips below and with some time and patience you may have cat-free counters forever! -Address the question, 'Does my cat have enough high space?'. Cats need high places to sit from. 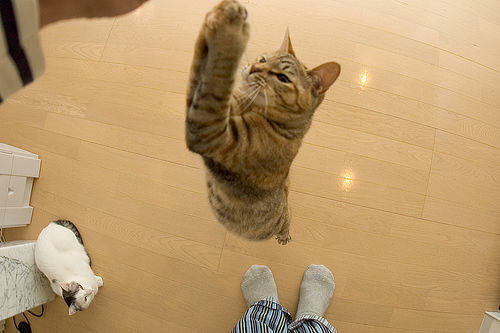 If your cat is jumping on counters and tables he/she may just not have any other place to go. If you don't have a cat tower or high scratching post, purchase one now and see if you can teach your cat to use that as his/her jumping area. · Use a spray bottle to spritz your cat every time he/she jumps to the unwanted area. The down side of this approach is that your cat may link you to the nasty squirt he/she receives as well. · Give your cat a firm 'no' when he or she does the unwanted behavior. Never 'punish' your cat or overly scream or scare your cat. This can make your cat learn that you are a very scary being whom he/she should stay away from and dislike. If you are not home very often this method may not work very well as you won't catch your cat in the act very often and thus your cat won't get a constant aversion message. · Place double-sided sticky tape on the area. Your cat will hate how this feels on his/her paws and soon stop going there. · Place aluminum foil on the area. Again cats hate this feeling on their feet. · Place upside down mouse traps on the area and then put a piece of wax paper over that (some pet stores even have an official version of this old home-made trick called the Snappy Trainer®). When your cat walks on the wax paper it will get an unsuspecting scare. After a while your cat will learn that this area is more trouble than it is worth. · Place plastic liners bottom side up (with the little pokey parts facing up). Your cat will not like how that feels on his/her paws at all. · Never reward jumping on counters or tables with food or treats to make the cat 'go away'. · Purchase a cat aversion mechanism from your local pet store. Now-a-days pet stores offer a variety of products from motion sensors that make a very loud noise to devices that emit ultrasonic waves when your cat goes near it. If all else fails you may consider such a device to help train your cat. ***Medical and care advice in this article is for your knowledge and information only. It is not a substitute for a veterinary appointment or an actual diagnosis for your pet. If you feel your pet has a health or behavior problem please consult your veterinarian immediately for specific advice tailored to your individual pet.